8:00 PM: Vivantha by Taj, Yeshwantpur, First to reach the place and joining me was Mr.Raju on his 500CC our new members on this ride. 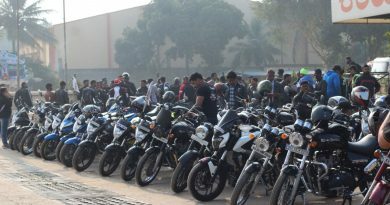 The assembly time was delayed by us due to the insane ans as usual city traffic in Bangalore city, where our members need to ride from different parts. This ride to the assembly point was a ride in itself. A short briefing and we head out on the Bangalore Highway towards Chitradurga, our resting point for the night. Since its a group ride we have cut the total distance of 650 km into 200km for the first leg and rest 450 km for the second leg. 12:00 PM: Hotel Ravi Mayur, Chitradurga, we found it a perfect pit-stop en-route Goa with decent Hotels to split our 650+ km journey. The backup car following us joined in around 1:00 AM. 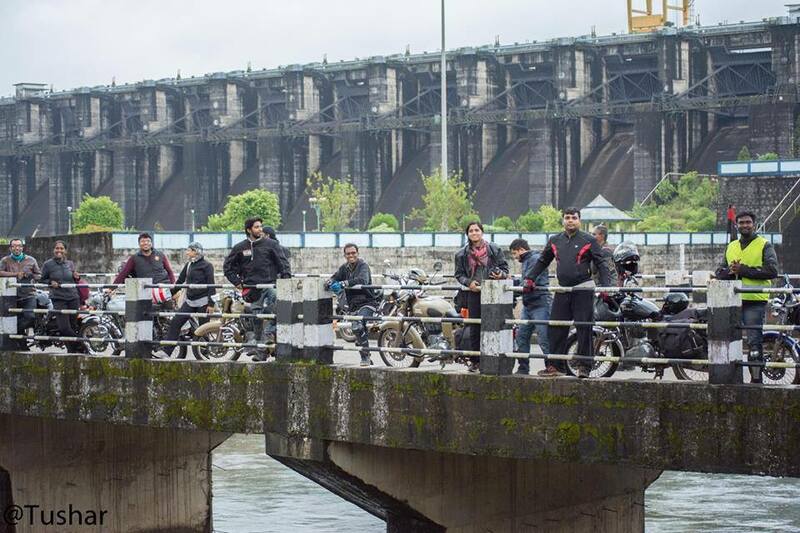 We were still waiting the couple from Chennai who was supposed to join in for the ride. 3:30 AM, waited for some more time and we hit the beds while they have reached only around 5ish. Kudos to them riding all the way from Chennai, and while Anand was tired, Rekha took up the bike and rode the last one and half hour stretch to reach us. 8:00 AM, All set to hit the road again, with some nice parathas in a punjabi dhaba en-route Davengere. 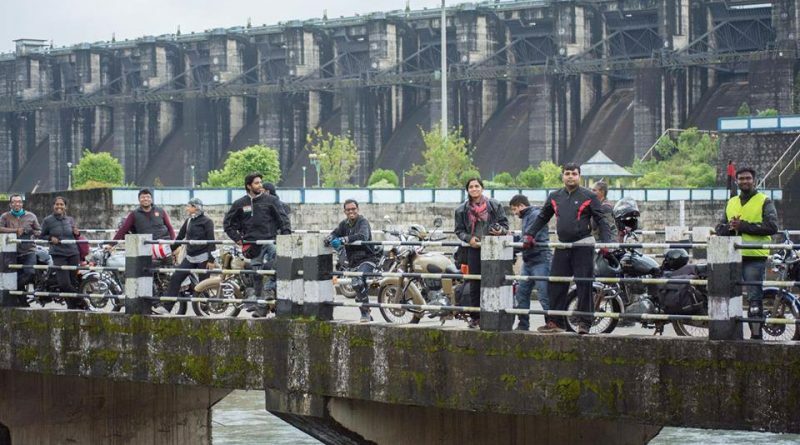 We have took a diff route which turned to be the highlight for this ride, thanks to Arpan’s routing. Instead ot the conventional Bangalore – Hubli – Goa we have tried Bangalore -> Chitradurga -> Haveri -> Yellapur -> Idgundi -> Virje -> Karwar -> Goa. When we have first entered this detour, for a while few of us were skeptic as the road was too narrow and no signs of any bikes or cars passing that way, but however we continued. 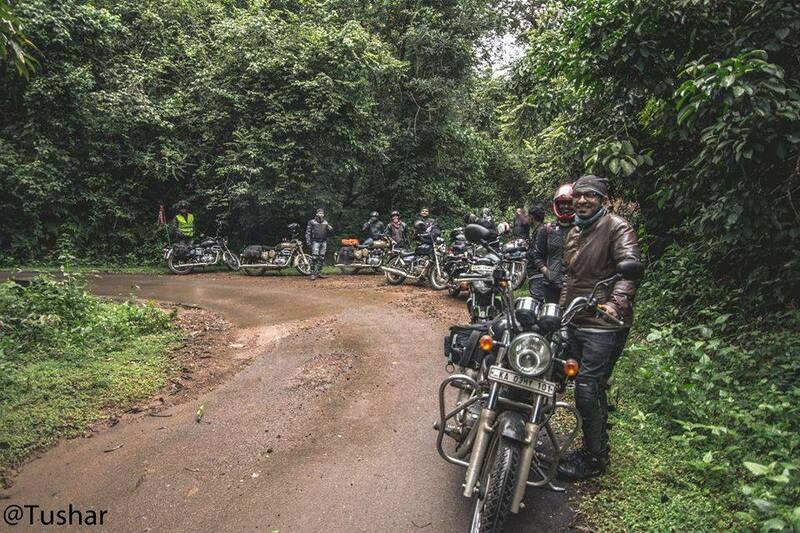 Believe me, this was one of the best stretch in South India to ride in. 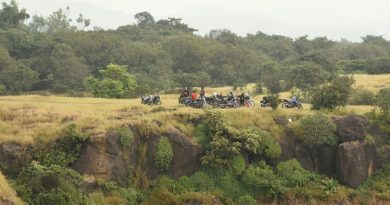 Waterfalls, water crossings and beautiful landscapes, reminds of Himachal and Rishikesh. However not recommended when travelling or riding alone, we have managed, thanks to Chetan and his language skills. We have reached the outskirts Goa only by 9:30 in heavy rains, its not ended yet. The ride from the outskirts to the destination is another good two hours. Thanks to the GPS on the Versys of Rana Sir we have reached Augusta Villa, in Candolim around 11:00 PM. Dinner planned at Brittos, but as it was closing by then we checked in the adjacent Anthony’s on the Anjuna beach. First night of Goa Nightlife. Entry was only for couples, however we could manage to get in. 1. Agauda Fort: Seen in many movies and has some good views of the beach. We were hardly for 15 minutes as the crowd was too much that people touch each other as if its some mela going on over there. The underwater prison was closed to public in those months. 3. 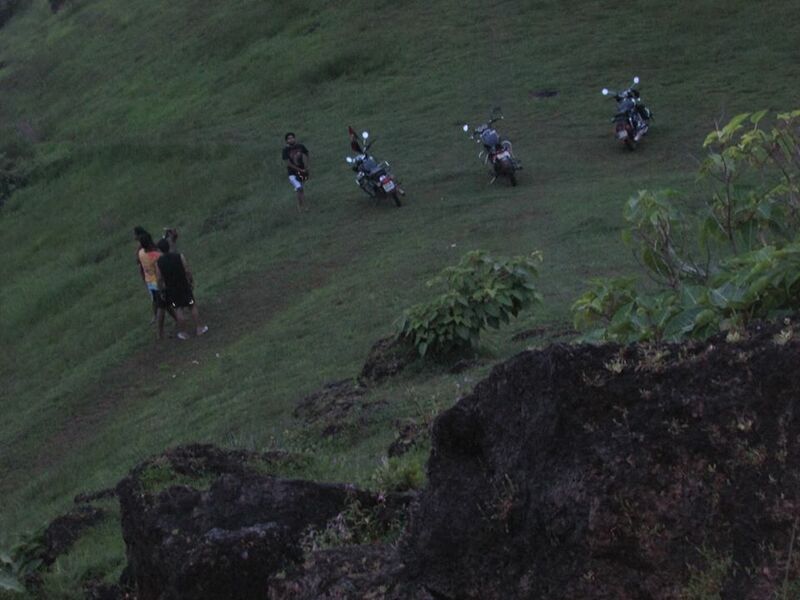 Vagator Off Roading: In the evening we head out to Vagator cliffs, the best views of goan beaches are from the hillocks. Beneath that happen the famous Sunburn Festival and The Rider Mania. 4. 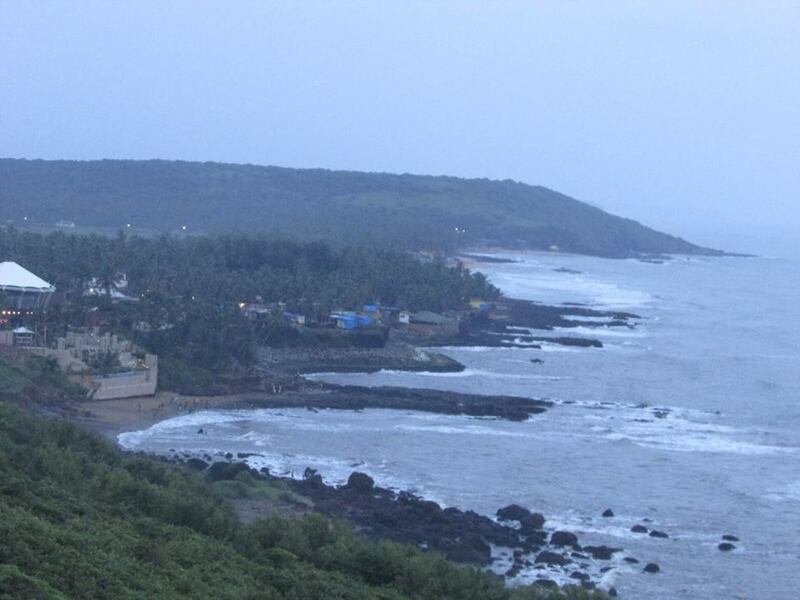 Fish land Shack, Vagator Beach: Kings beer, the local beer @ Rs 35, the beast deal in Goa available anywhere. Trance has hit us at this place and me and Arun were waiting to find a right den for some trance. We split into beaches now, the couples head out to some discos where sadly there is no entry to single guys like me. lol. However most of the places the ratio of girls to boys in Goa is 15% to 85%. So no point in getting in unless you have your own girl or a guy. 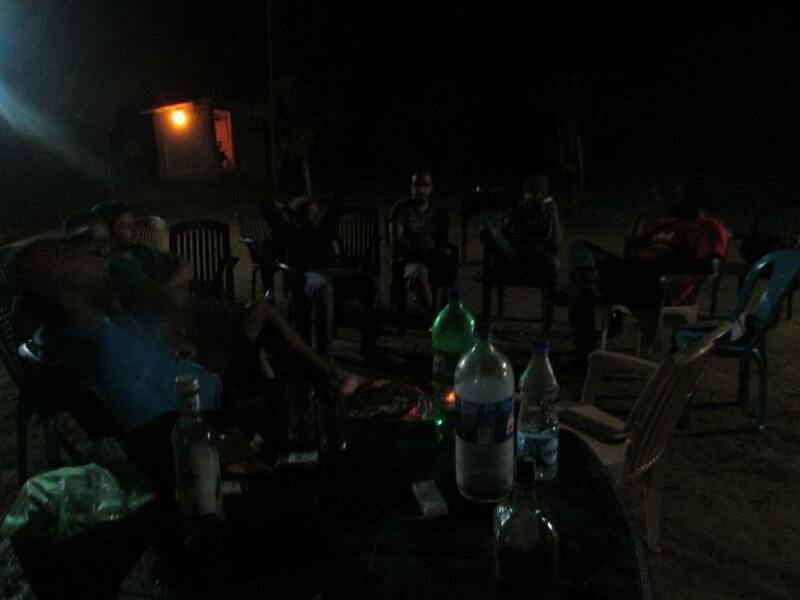 Dont know whats wrong with Goa Nightlife this year..
5. 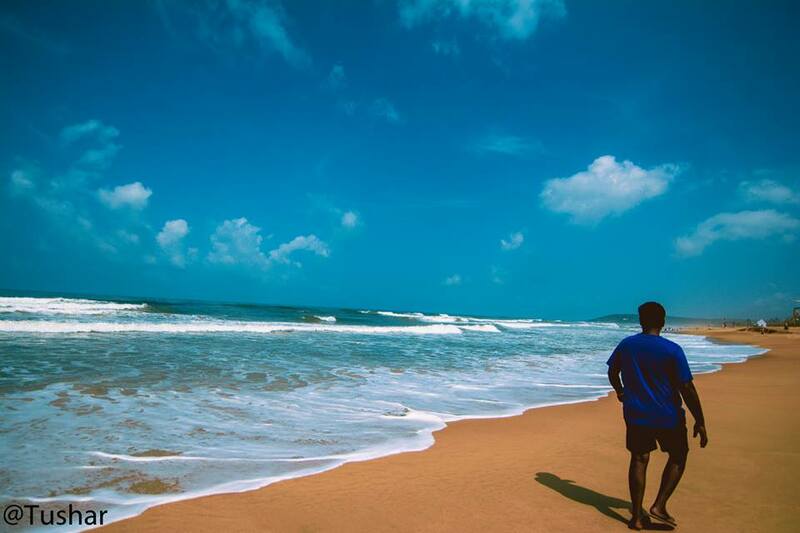 Curlies Shack, Anjuna beach: It a huge place, however not very happening to us as we are already in a transic mood. It was again in the first floor, where some good music is played. Shiva valley, next to curlies is a place to be for some good music, but sad it was closed. Hilltop -> Closed. Thalassa -> Closed. Whats open now? We are not in a mood to give up finding a proper place to dwell into Goa Nightlife. 6. Titos, Baga Beach: The most talked about and heard night club in Goa. 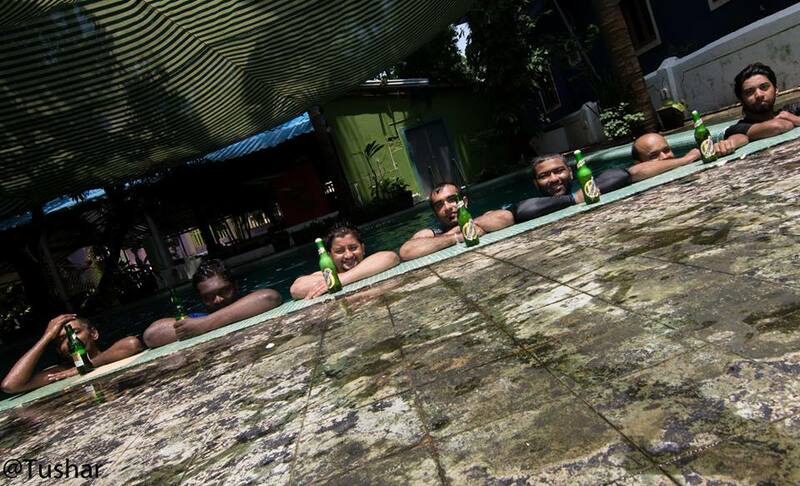 Few of our guys head back to our villa with some beers and food to chill-out in the pool itself. Myself, Arun and Rana sir still haven’t give up :-). Entered the Tito’s street I feel something not special or common about the place. With all that Bollywood music and same crowd, it was more like an Indranagar 100ft road, than some night club in Goa. Mambos the other night club next to Titos, a similar scene. Rana sir decided to have dinner in adjacent Titos dining and not wasting anytime we head back to Vagator and inside. 7. UV bar, North Anjuna: The place we have decided for the night Prim Rose or UV bar. 11:00 PM already, could not see anyone going in or coming out of the places, but the ticket guys claim people only start coming after 12:00 AM. Thats something new for us, but lets wait and see. We have checked in the hotel Mango Tree nearby by which has some good food. Wasting no time we head in paying Rs 1000 cover each. Ahhhh, just few steps into it we could smell things ;-). A small lane leading near to the beach and the lady DJ, guess Russian by the eyes, with a crowd of around 50 +. It was psy trance. Welcome to Goa Nightlife. Moment of relief, finally found our kinda place. Everything was available inside and we got into the groove. Adjacent was a small dark cave which can hold 20 people and with only a 10 ft woofer in between. It was full power at Goa Nightlife. Around 4:30 we left Goa, everyone tank up at the last petrol bunk as the fuel was very cheap compared to karnataka :-). 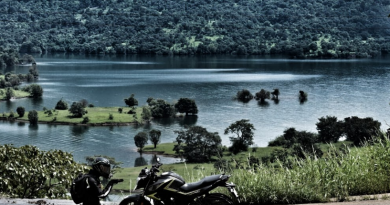 Goa to Dandeli: This was again one of our best routes in this journey. Not very safe again for single riders or couples. 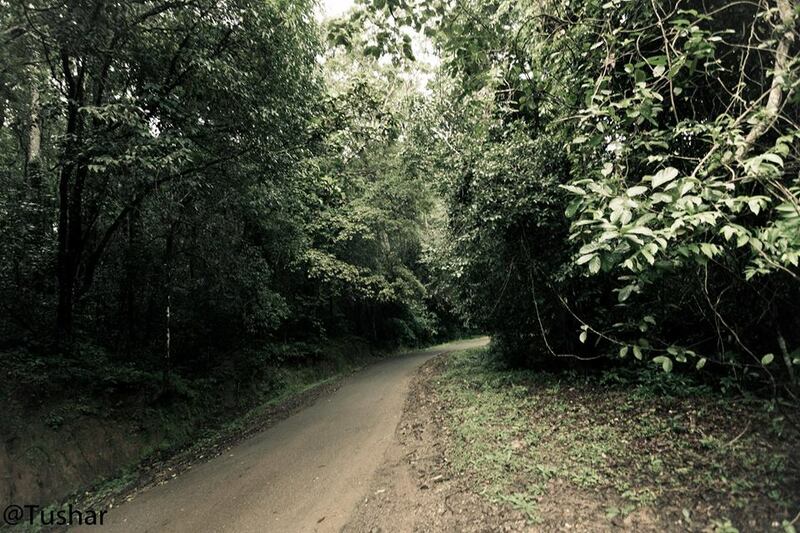 No shops, no lights and sign boards of the forest dept about animal crossings. In this road we had a puncture, and yes right next to a puncture shop, which is obvious that some nails etc were strategically placed. 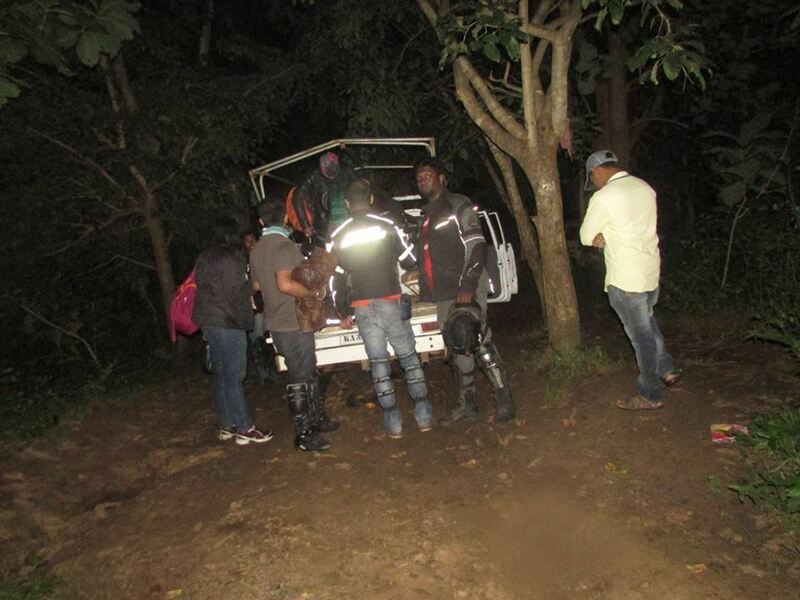 By now, seeing the road conditions we have advised the other two couples who were supposed to join in later to head back to Goa for the night as it was not very safe. Only around 10:))PM we have reached Dandeli. Its not done yet, there was some serious offroading to reach the Panther Stay, where we booked some camps for an experience. Bikes could not make it so we were transferred in a 4X4. Campfire and nice party to conclude our Goa Escape. 10:00 AM: Nice breakfast and scenic locations around the stay we could see only in the morning. We set ride of the 460+ kms, which was decent on the highways and pit-stops in between, cruising at 90-100 kph in some rains at time we have comfortably hit the Bangalore toll around 6:30 PM. see all famous cities on easy way and know about India.